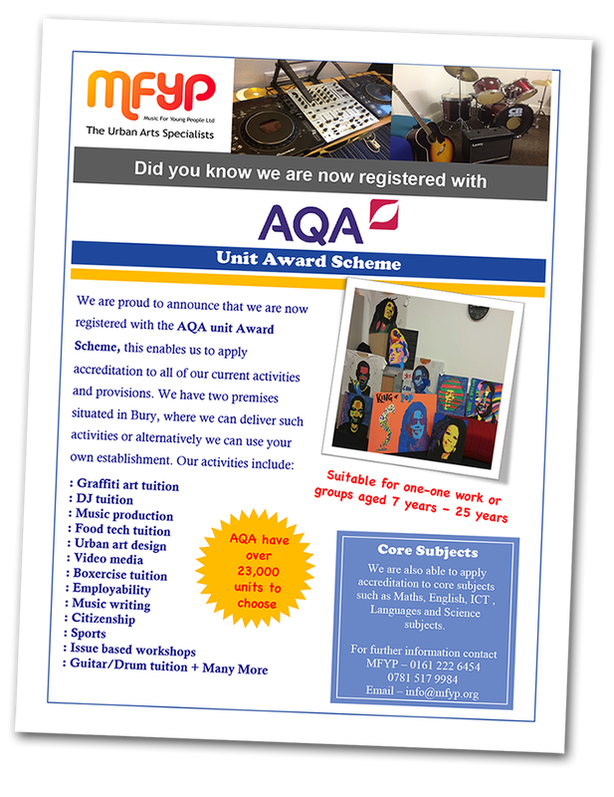 The Unit Award Scheme is an accreditation scheme for recognising learning and success. It rewards participates for personal progress and achievements which are often not recognised by formal qualifications. MFYP Ltd is trained to use this fantastic scheme and can apply to all of our current activities + more. This can be used for pupils of all ages and ideal for one-­‐one work or with groups. Provides clear short or long term accreditation pathways to meet individual student needs. The following prices are to register pupils with AQA, administration time and submitting the final work for assessment. Once all has been submitted we aim to retrieve certification around 3 - 4 weeks. For one - one tuition, we charge £39.00. This enables students to receive certification for up - to 4 separate units. 6 – 8 pupils = £36.00 per pupil. (4 separate units). 9 – 12 pupils = £33.00 per pupil. (4 separate units). 13 – 21 pupils = £30.00 per pupil (4 separate units). Contact us if you wish to apply The UAS to our activities and provisions.